The guest can cancel free of charge until 3 days before arrival. The guest will be charged 50% of the total price if they cancel in the 3 days before arrival. The guest will be charged a prepayment of 50% of the total price in the 3 days before arrival. Romantic getaway in a volcano crater! 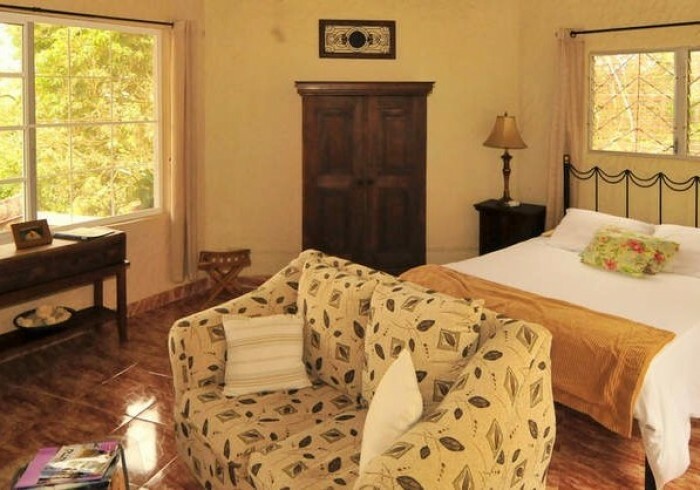 Golden Frog Inn is a place where you can relax your mind and enjoy the peace that nature brings. Located just 1 hour and 30 minutes from the city of Panama, we invite you to enjoy the unique experience of being in one of the world's largest inhabited volcanoes. El Valle de Anton is popular for its spring like climate, and a huge biodiversity of animals and plants. Arriving at Golden Frog Inn you will be pleased to see a breathtaking view of the surrounding mountains and our lush gardens. We have terraces where one can relax in a hammock or just enjoy the pool with the family. There are many natural trails around our property where you can see animals like sloths and birds. Just 10 minutes away is many local attractions like India Dormida trail, Chorro El Macho, and Zoo El Nispero. On weekends there is also a craft market.